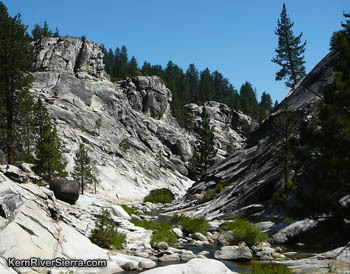 The granite wonderland of The 7 Teacups, just above the confluence of Dry Meadow Creek and the Kern River. Photo taken in late winter. A technical rappel on the 7 Teacups. Photo from Ropewiki.com under Creative Commons. 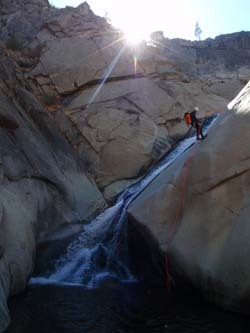 In recent years, the sport of Canyoneering has been increasing in popularity in the mountains of the Southern Sierra. Combining rappelling, hiking, and sometimes swimming and jumping off waterfalls, canyoneering makes an excellent summer adventure. Warning: Dont attempt this without proper experience, instruction, practice, and a guide! 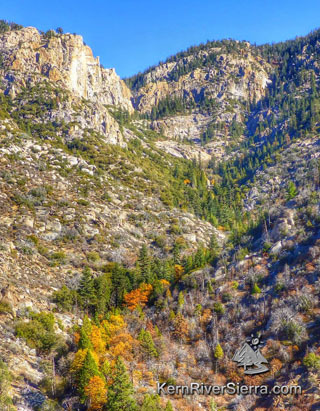 North of Kernville, there are numerous creeks that have carved out precipitous granite gorges and waterfalls on their way to the Kern River. Many of these tributaries are now being explored by adventurers, and some are actually seeing commercially guided trips. The most popular location is Dry Meadow Creek's "7 Teacups," which has even been written about in an Alps mountaineering magazine. The 7 Teacups certainly makes the 7 Wonders of the Kern River Sierra list. Because its a relatively short, convenient, and very spectacular canyon just 20 miles north of the ultimate recreation town of Kernville, it is now on the bucket list for California Canyoneers. It is considered to be one of the best class C canyons in the state. ModernHiker.com calls it the "Best introductory Class C canyon in North America." Dry Meadow Creek emanates from the land of the Giant Sequoias and then plummets off the edge of solid granite down to the Wild and Scenic section of the Kern River. On its way down, it has created amazingly sculpted pools and waterfalls. (The Tea Cups are also kayaked in the spring at higher flows). RopeWiki.com has an excellent source of information. ATS Adventureworks occasionally provides guided trips down the Tea Cups. CanyonsWorldWide has an article with great photos, including local Evan & Johnie. Christopher Earls Brennen has one of the original write-ups on the canyon here. Here's low water action from November 2014, and some earlier summer footage: Greater Outdoor Adventures footage from June 2014, and Hi-def footage with lots of cliff jumping July 2014 and another. Note! Be wary of the rapids on the Kern River below Dry Meadow Creek, especially the dangerous Class V Carson Falls. Floating the Kern River is not necessary after completing the Teacups. Take the trail if you are unsure of the river. Access: Johnsondale Bridge is 19 miles north of Kernville on Mtn Hwy 99. There is a hiking trail, River Trail, that leads to the bottom of the Teacups at the Kern River. From the Johnsondale Bridge it is 2.5 miles up the river. 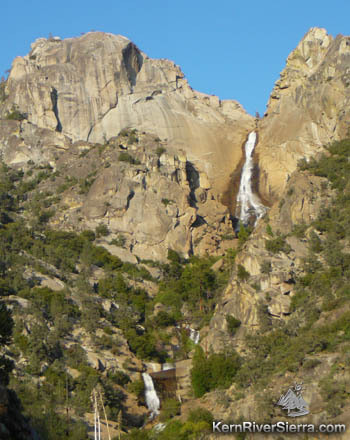 According to J.C. Jenkins "Self Propelled in the Southern Sierra," Salmon Creek Falls is the highest waterfall in the southern sierra. 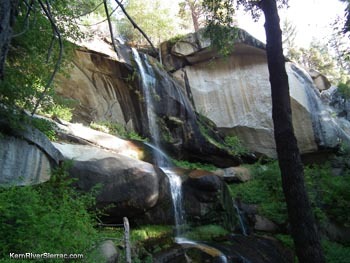 This Yosemitesque creek has inspired adventure and exploration for years. 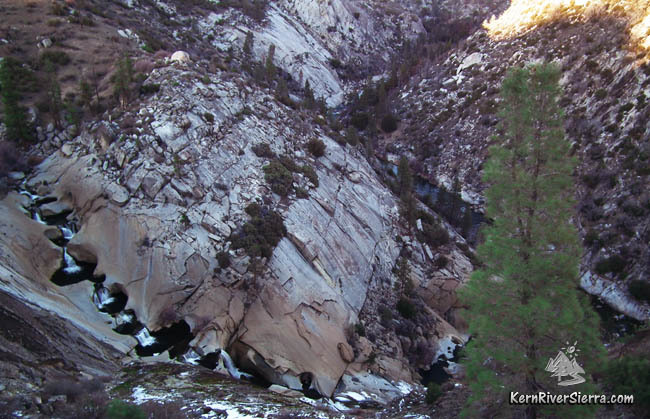 The site of the California Eco-Challenge Finals in 2002, this creek's canyon has an enormous wall of solid granite. 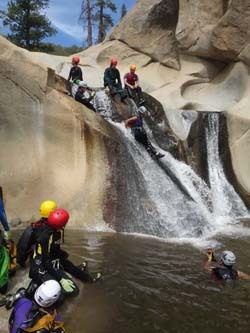 After hiking and biking on Cannell Trail, the Eco-Challenge participants did 500+ foot rappel near the waterfall and then had to find a route all the way down to the Kern River. The old Domelands rock climbing guidebook depicts 2 routes that follow cracks on the northern 400 foot cliff. There are other routes in the area. More recently Matt Maxon and a crew canyoneered Salmon Creek, and wrote about the details here. They did 9 rappels, with one 670 foot multi-pitch rappel. The top is accessed by the Salmon Creek Trail (more photos) from Horse Meadow. The Rincon Trail crosses Salmon Creek at about the 4500 foot level. There is an amazing canyon and more waterfalls below this point as well. 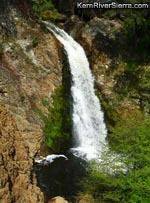 One of the waterfalls below the Salmon Creek Bridge & Rincon Trail. Five rappels are possible on this section with a spectacular 140 foot drop into a dramatically narrow canyon. Access this canyon by hiking the Rincon Trail to the bridge at Salmon Creek and hike down. Unfortunately, this area has been vandalized with graffiti and trash in the past. Locals REALLY like to keep quiet about the area to protect it from some of the irresponsible and inconsiderate summer visitors. 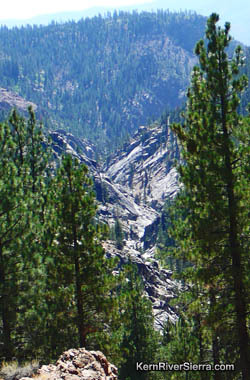 The Little Kern contains an amazing canyon between the Little Kern Bridge and the Forks of the Kern in the Golden Trout Wilderness. Both trailheads are accessed by Lloyd Meadows Rd. Canyoneering the Little Kern is safer at very low flows to avoid dangerous sieves. Some people have scrambled the entire way down, while others describe 6 mandatory rappels. RopeWiki.com info here. Above the steeper canyon on the Little Kern. 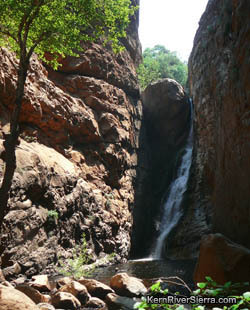 Nobe Young Falls at very low water. On the Western Divide, Nobe Young Creek also sees some canyoneering action. Upper hike description here. It has at least 6 rappels; one at 100 feet. Find a trip report and some beta here by MattMaxon and more here. The creek is canyoneered is between The Western Divide Hwy (107) and Last Chance Road (22S02), which also connects to Lloyd Meadows Road. 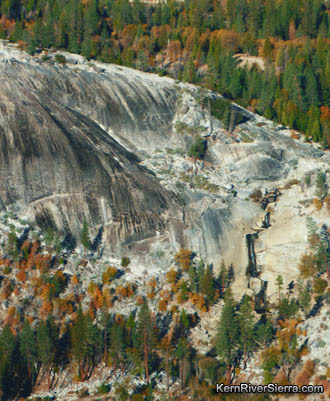 Peppermint Creek Falls in the fall as seen from the air. Very low flow. NOTE: Private Property just below the main falls, must be skirted to reach the lower sections of Peppermint Creek. 5 Rappels up to 130 feet. Another tempting trip might be on the upper sections of Peppermint Creek, between Western Divide Hwy and Lloyd Meadows Road. A gorge of bedrock and waterfalls looks amazing. A gorgeous creek that drops to the Wild & Scenic Kern River. 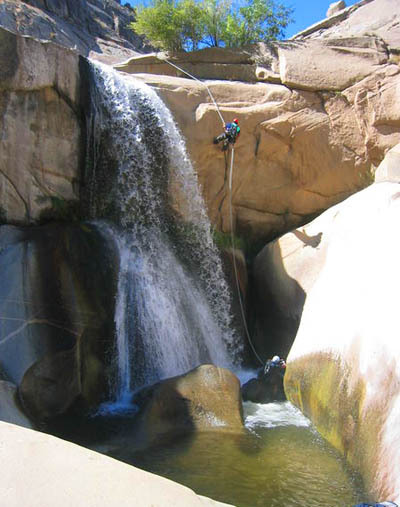 There are countless granite bedrock creeks and canyoneering possibilities in the Kern River drainage. If you have the skills and knowledge, go explore! * All Ratings are based upon opinions described on various websites. They represent an educated guess only. Please be realistic with one's training and abilities; recently there has been a major injury associated with canyoneering in the area.